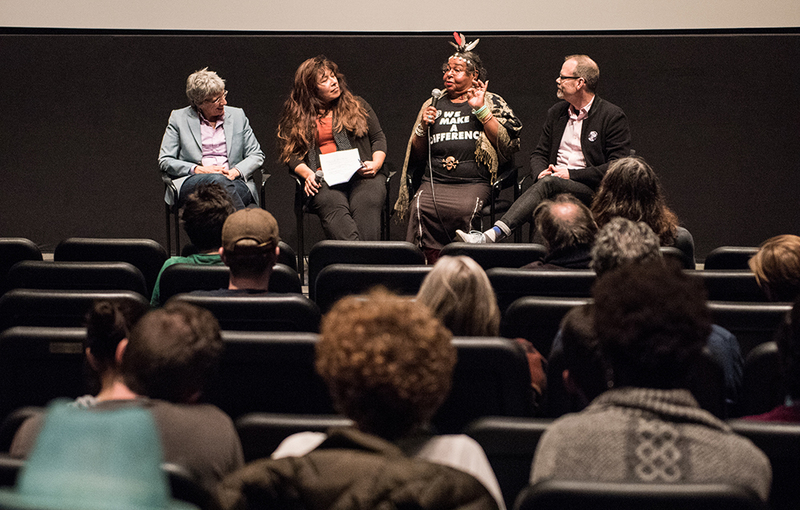 Producer L.A. Teodosia, professor Maria Agui Carter, subject Victoria Cruz, and director David France participated in a Q&A following a screening of The Life and Death of Marsha P. Johnson. David France, the director of The Death and Life of Marsha P. Johnson, said the film’s production team developed a community outreach campaign to create free screenings of the film across the nation. Ninety of the 140 screenings were cancelled due to allegations against the director of using another filmmaker's archive without credit. Anna Feder, the curator of the Bright Lights film series, screened the documentary to dozens of viewers Tuesday despite the film’s controversy. The award-winning Netflix documentary is about Johnson, an African-American gay rights activist, drag queen, and prominent figure of the 1969 Stonewall Riots. It follows Victoria Cruz as she investigates Johnson’s 1992 death. Transgender activist and African-American filmmaker Reina Gossett accused France, a queer cisgender white man, on Oct. 6 of stealing a decade’s worth of her research for her movie, Happy Birthday Marsha! A Q&A followed the showing with France, Cruz, and L.A. Teodosio, one of the film’s producers. Feder said none of the guests were paid to speak at the showing. Speakers are not typically paid for appearing at Bright Lights screenings. Feder said she first saw the documentary in June at the Provincetown International Film Festival and was unaware of the allegations when curating the Bright Lights series in July. The accusations caught attention after Gossett posted on Instagram the same day the film appeared on Netflix. Feder said she asked Gossett if she could show Happy Birthday Marsha! as part of the Bright Lights series. Feder said she received an email from Star People, the film’s production company, stating the film was incomplete. When she asked if she could screen the trailer and encourage donations, Star People initially responded yes. She said she asked them to inform her of the film’s completion so she could include it in the spring series, but she has yet to hear back. Star People could not be reached for comment. Two promotional sponsors, The Network/La Red and the Massachusetts Transgender Political Coalition (MTPC), pulled their sponsorship of the Bright Lights screening in light of the allegations. JP Delgado Galdamez, an outreach and education associate of The Network/La Red, said the organization declined sponsoring or showing community screenings after speaking to trans women of color and community members in support of Gossett. Mason J. Dunn, the executive director of the MTPC, said although they were aware the allegations were inconclusive, the MTPC gives the weight of the situation to trans people of color when accounting the oppression they face. “If a trans person of color says that they have been wronged and the community is backing them up, then it is my job to back them up as well,” Dunn said. Emerson’s Alliance for Gays, Lesbians, and Everyone was one of the event’s sponsors. James Manley, a sophomore visual and media arts major and co-digital communications director of EAGLE, said the organization chose to promote the documentary because the film features a prominent LGBTQ activist. “As long as [France] acknowledges the allegations constructively, there shouldn’t be a problem,” Manley said. Chris Henderson, co-president of EAGLE, said the organization decided to continue sponsoring the event after learning Feder had reached out to Gossett. Feder said she had worked with the MTPC before and respected both organization’s decisions. She said she received no direct complaints but acknowledged three posts on the Facebook event. K. Martinez said they had mixed feelings attending the screening as a gender nonconforming person of color. They said they saw the documentary three times, once before the allegations. They said they were drawn to the film because there are few stories about queer people of color and their history. During the Q&A, France said he disagreed that there may be stories some people cannot touch. In an interview, France said he proved his sources in a Jezebel article, where a statement from Lesbians Organized for Video Experience (L.O.V.E.) Collective said France acquired licensing for footage which Gossett uploaded without owning legal rights. He said the production has a 1,500 page document of sources and that they had to submit the licensing documents to attorneys, but he did not want to post it on social media in response to Gossett. During the Q&A, Teodosio said the documentary was a massive research project with a 22 person research team, and the team thought of ways to preserve their documents so others could use them going forward. Maria Agui Carter, a visual and media arts professor and filmmaker, hosted the Q&A and spoke about her experience as a Hispanic filmmaker. In an interview, France said two minutes and 28 seconds of the one hour and 48 minute film consists of footage on Gossett's Vimeo page, but he gathered the footage from their original sources. During the Q&A, France said the production has reached out to Gossett to discuss the allegations and to see if they could work together in the future but has yet to arrange a meeting.